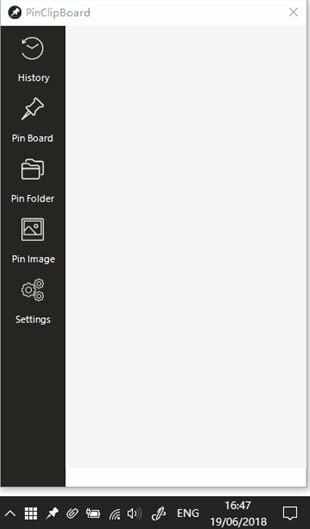 PinClipBoard is a very simple and efficient clipboard manager. Most of the work you do is done through your computer. And if your work involves a lot of copying and pasting along with keeping relevant pieces of information handy to refer or to use in creating documents, then PinClipBoard is essential for you. Clipboard managers are handy tools that increase efficiency and time consumption while making documents. Frequently used documents as well as images and folders can be pinned on the interface of Clipboard managers making retrieval fast and easy. Whereas computers and mobiles let you use only one copy command at a time (while each document creation requires far more than one), using PinClipBoard lets you collect and store your most often used copy/paste documents and pictures at one place, making their retrieval and subsequent usage extremely handy. This clipboard tool makes the creation of multiple documents an easy and time-saving process. Without this tool, the amount of time required for completion of official work will easily be twice or thrice that than what it is when utilizing the tool. PinClipBoard is truly an efficient and easy clipboard manager that has a wider application than initially perceived. It can be hot-keyed to further enhance its efficiency. This clipboard app for windows is an excellent download and it comes with a guarantee of no ads, which is a surprise considering it is absolutely a free software app. When using it the first time, it lets you familiarize with itself in less than 15 minutes and you will gain complete proficiency over it (along with a detailed understanding of all its features) within the first working day itself. PinClipBoard is one of the easiest and most efficient Clipboard tools out in the market today. It can be utilized extensively in all kinds of document creation. User-Friendly Interface: The interface is really simple and straightforward to use. Auto Update: The PinClipBoard automatically updates itself, ensuring the best performance for its customers. Clipboard History: The PinClipBoard maintains a list of all data which is copied and stuck to the clipboard to secure easy clipboard access for files copied even a few weeks ago! Pin Your Favourite: Here you can pin your most used items for instant referencing and copying. Instant Support: The PinClipBoard support helpline will respond to any queries/ issue within 24 hours of the query being generated. Pin Frequently Used Folders: PinClipBoard also allows users to ag’ the folder locations within their computers which they reference frequently. Pin Favourite Images: As for folders and documents, you can also pin your most frequently used images so that they are a simple double-click away. Very Easy to use: Arguably, its greatest asset is the ease and simplicity of its design and interface making it extremely easy to utilize. The best part about the PinClipBoard is its ease of usage. Its advanced in’ feature is what makes all the difference though. Using a keyboard hotkey you can copy text to the clipboard and get the entire list of recently copied data (you can modify the parameters for this list as well). If amongst all the copied text is some data that is being used more often than others, then you can simply pin it to the “Pin Board” and use it with more ease. The PinClipBoard goes beyond the other generic clipboards out there on the market by ensuring that even images can be pinned to it for easier reference. If there is a folder within your computer that you reference often to find text or images, well you can pin that folder too! In order to pin text, an image or a folder on PinClipBoard all you need to do is drag the relevant item there. To open the image or folder simply right click or double-click. PinClipBoard also saves the text and images pinned to it even if you have deleted them. This ensures that even deleted items can be used if the need arises as it often does while creating documents! No other clipboard tool packs so much utility in such a light and easy frame. In addition, to access the clipboard, there is no complications or waiting time. It is simply a very easy prospect. Its interface is designed with an air of simplicity and usability. After using it there were no superfluous features that I found and its practice of saving text and images even after they were deleted is a godsend for document creation purposes!